Winona Ryder, Victoria Beckham, Kim Medcalfe, Alexa Chung, Demi Moore, Brooke Shields, Erin O’Connor, Peaches Geldof, and Helen Christiansen. As one can imagine after such high praise, I was excited to try it for myself! I wanted to see if this product could live up to all this hype! When the product arrived I immediately tried it, I was like a child at Christmas. The first thing I noticed was the citrus aroma as I squeezed some cream out of the tube. The cream has a wonderful density and spreads easily across the skin. I know why it is named ‘Skin Food’ as it feels like you are nourishing the skin as you apply it. Once applied it creates a soft barrier across the skin, and is smooth to the touch. After a few days of use, I’m noticing softer skin and a brighter complexion. I am finding new uses for the skin food each day! It has become a regular in my skin care regime! To get more information about this product please click here. 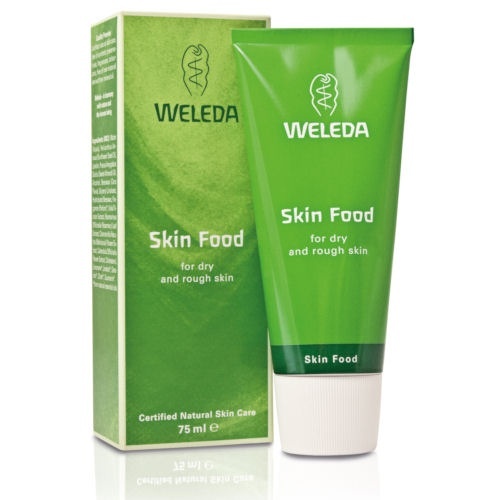 Or £5.95 for a 30ml tube, plus at the moment there is free delivery from the Weleda site. You can buy it if you click here. I give it a fabulous 10 lipsticks out of 10! Previous Post: Quote Of The Day 16th MayNext Post: Cara Delevingne Dazzled Last Night At Cannes Opening Ceremony!